The preparatory document for the Special Assembly of the Synod of Bishops for the Pan-Amazon Region to be held in October 2019, was presented this morning. The Father’s Providence, and the goodness of creation, reaches its climax in the mystery of the Incarnation of the Son of God, which draws near to and embraces all human contexts, but especially that of the poorest. The Second Vatican Council mentions this contextual closeness with terms such as adaptation and dialogue (cf. GS 4:11; CD 11; UR 4; SC 37ff), and incarnation and solidarity (cf. GS 32). Later, especially in Latin America, these words were translated as option for the poor and liberation (Medellín 1968), participation and base communities (Puebla 1979), insertion and inculturation (cf. Santo Domingo 1992), mission and service of a Samaritan Church and advocate for the poor (cf. DAp 2007). The death and resurrection of Jesus illuminated the destiny of all of creation, filling it with the power of the Holy Spirit, who had already been evoked in the Wisdom tradition (cf. Wis 1:7). Easter brought to fulfillment the project for a “new creation” (cf. Eph 2:15; 4:24), revealing that Christ is the creative Word of God (cf. Jn 1:1-18) and that “in him were created all things in heaven and on earth” (Col 1:16). “In the Christian understanding of the world, the destiny of all creation is bound up with the mystery of Christ, present from the beginning of all things” (LS 99). Therefore, as Pope Francis pointed out, the task of evangelization cannot “mutilate the integrity of the Gospel message” (EG 39). In point of fact, its harmonious integrity, “requires of the evangelizer certain attitudes to aid acceptance of the proclamation: closeness, openness to dialogue, patience, and cordial welcome” (EG 165). It means accepting and comprehending that “everything is connected” (LS 91, 117, 138, 240). This implies that the evangelizer should promote projects related to personal, social, and cultural life through which we can nurture the integrity of our vital relationships with others, with creation, and with the Creator. Such a call requires attentive listening to the twin cry of the poor and of the earth (cf. LS 49). 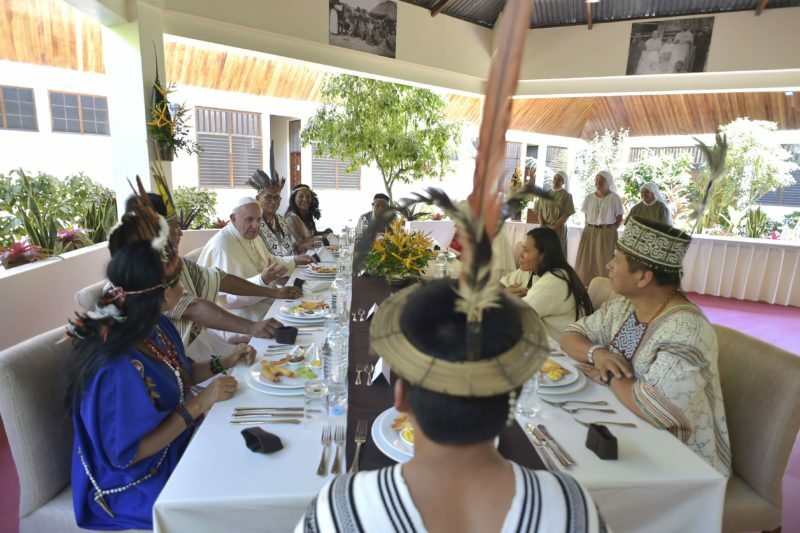 In order to transform the Church’s precariously-thin presence and make it broader and more incarnate, a hierarchical list of the Amazonia’s urgent needs should be established. The Aparecida document mentions the need for “Eucharistic integrity” (DAp 436) for the Amazon region, that is, that there be not only the possibility for all the baptized to participate in the Sunday Mass, but also for a new heavens and a new earth to take root in the Amazon Basin in anticipation of the Kingdom of God.